Profitability continues to decline, and the airline giant is falling even further behind its top rivals in terms of profit margin. American Airlines (NASDAQ:AAL) experienced a rapid rise in its profitability a few years ago, powered by the combination of a late-2013 merger with US Airways and falling oil prices. However, since early 2016, American's earnings power has receded just as quickly. Last Thursday, the world's largest airline released yet another subpar earnings report. 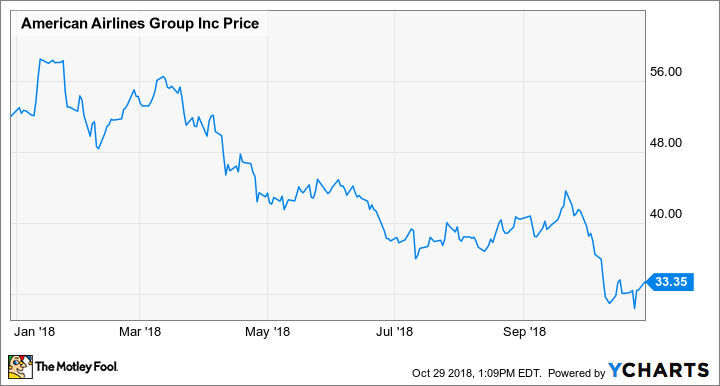 While American Airlines has several initiatives in the works that will hopefully stabilize its earnings soon, stiff (and growing) competition from United Continental (NASDAQ:UAL) will make it hard for American to achieve the kind of rebound that management seems to expect. Airlines have had to cope with a huge jump in the cost of jet fuel this year. This has weighed on profitability across the industry. But American Airlines has been particularly hard hit, as its unit revenue growth has slowed compared to that of rivals. In the third quarter, American's revenue per available seat mile (RASM) rose a modest 2.6% year over year. That didn't come close to offsetting a 37.6% surge in the carrier's average jet-fuel price, which reached $2.30 per gallon. As a result, while American Airlines was able to limit its adjusted nonfuel unit cost increase to just 0.8% last quarter, its adjusted pre-tax margin plummeted to 6% -- right at the midpoint of management's quarterly guidance -- from 10.7% a year earlier. American Airlines' profitability still hasn't bottomed out. Image source: American Airlines. Looking ahead to the fourth quarter, American Airlines is set to report a significantly smaller pre-tax margin decline -- but a decline nonetheless. Management currently projects that the carrier's adjusted pre-tax margin will come in between 4.5% and 6.5% this quarter, down from 7% a year ago. Much of the projected improvement relates to the year-over-year fuel headwind beginning to subside. American Airlines expects to pay between $2.30 per gallon and $2.35 per gallon for jet fuel this quarter, which would be up 20% to 23% year over year. The carrier's guidance also calls for adjusted nonfuel unit costs to be flat, plus or minus 1 percentage point. However, unit revenue growth will remain sluggish, mainly due to tough conditions in parts of Latin America. For the fourth quarter, management projects that RASM will rise 1.5% to 3.5%. That's roughly in line with American's performance last quarter and more than 1 percentage point below the level of unit revenue growth that Delta Air Lines and United Airlines expect to achieve. The only real advantage that American Airlines stock has right now is its low price. After falling 36% year to date, the shares currently trade for about seven times the midpoint of the company's earnings-per-share guidance. While that's relatively cheap -- even for an airline stock -- American Airlines' balance sheet is weighed down by nearly $25 billion of debt and capital leases, creating a great deal of risk for shareholders. American Airlines' stock performance, year to date. Data by YCharts. If investors had good reason to expect a quick earnings recovery at American Airlines, the stock might be worth the risk. However, despite its cost-cutting efforts, American expects adjusted nonfuel unit costs to rise 1% to 2% next year -- a higher level of cost inflation than it's experiencing in the second half of 2018. There's also a substantial chance that fuel prices will continue to increase in 2019. More troublingly, competition from United Airlines will continue to grow. Given that United has raised its earnings forecast several times in 2018 despite rising fuel prices, it's likely to maintain its plan for 4% to 6% annual capacity growth in 2019 (and 2020). This poses a threat to American Airlines' market share and profitability, due to the geographic overlap between the two airlines' route networks. As a result, American Airlines could struggle to accelerate its RASM growth next year, despite the various revenue initiatives it has laid out. Until it proves it can withstand the competition from United, investors shouldn't be tempted by American Airlines' low stock price.